If you’re new to kickboxing — or starting a new fitness regimen for that matter — joining a new group fitness class can be intimidating. You often don’t know the small nuances of a new class from how to wrap your hands, to when you take breaks — it’s all a little overwhelming at first. You’ll never get it right or perfect your first kickboxing class, but there are things you can do beforehand to make your first class a little more familiar. You’ve chosen Burn Kickboxing because it’s much more than just kickboxing — it’s a thrilling workout that pairs high-energy music with enthusiastic instructors who will support, coach, and push to be the best version of yourself! And, who doesn’t want that? 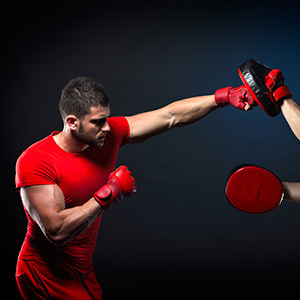 For tips to help you through your first kickboxing workout, join us in today’s post. You’re probably stoked about your first kickboxing class, and if you’re like many who’ve come before you, you like to come prepared! Before you hit the gym, there are some things to remember before you leave the house. You’ll be sweaty as you work through your kickboxing class, so you’ll absolutely need a water bottle! Keep your hydration balanced and stay hydrated throughout the class with a water bottle — do not leave home without one! Again, you’ll be getting nice and sweaty, so having a towel to wipe away excess sweat is extremely handy and considerate of those around you! Some kickboxing gyms will provide them and some won’t, so it’s important to have a pair with you. Hand wraps help keep your hands, wrists, and knuckles protected — especially in the beginning when they’re not used to the impact. Looking cute and stylish at the gym is perfectly acceptable, as long as it’s still functional. Make sure you have shoes that are comfortable, stable, and have great traction. It’s also important to wear a highly supportive sports bra so you’re not having to worry about too much bouncing and movement and can really give your workout your all. For the rest of your clothing, look for moisture-wicking materials and compression bottoms. It never hurts to learn or at least watch kickboxing moves before class. Below are the most common moves you’ll most likely see in your first kickboxing class. Stand with your feet hip-width apart with your non-dominant foot in front of the other. Your hands are near your chin. Start with your dominant hand and throw a punch, followed by another punch with your non-dominant hand. Keep your speed steady and consistent, and see how fast you can work through it each time. This is one of the most common kickboxing moves, but difficult to master. Begin by dropping your fist, keeping an elbow close to your ribs, with your palm turned in. Squeeze your obliques (the muscle group under your ribs) and rotate your torso. Bring your fist upward either striking the bag or punching the air. Doing these in intervals is great for building your cardio, burning calorie and fat! Stand with your dominant foot in front of your punching bag (perpendicular) with your feet shoulder-width apart. Bring your back foot towards your dominant foot, and turn and kick sideways. Bring your foot back to the starting position, bend and do a squat. Looking to define your leg muscles? The front kick helps develop your calves, quads, hip flexors, hamstrings, and core! Start with your left foot forward, fists by your face in a fighting stance. Gradually shift your weight to your right foot. Bring your left knee to your chest with your foot flexed, and your heel pulled towards your glutes. Kick your fists up, kick with your left foot straight from the hip, and lead the kick with your heel. Rest your legs around your punching bag, and get your hips as close to the base of the bag as possible. Do a sit-up, and then hold a 45-degree angle and punch the bag up to 10 times. When you’re a little more prepared with the things you’ll need at the gym and the moves you’ll be learning, it can help make your first visit more empowering. The important thing is to start. Start where you are right now and schedule a Burn kickboxing class today!